He was born in Turkey in 1963. He studied at the Economy Faculty of Marmara University in İstanbul. His first cartoon appeared in GIRGIR Turkish humour magazine in 1979. Then his cartoons were published in several newspapers and magazines. He illustrated many books. 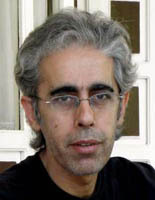 He won 109 prizes in an international and national cartoon competitions since 2000. He is teaching cartoon and illustration for a college students. He is married and have a child.